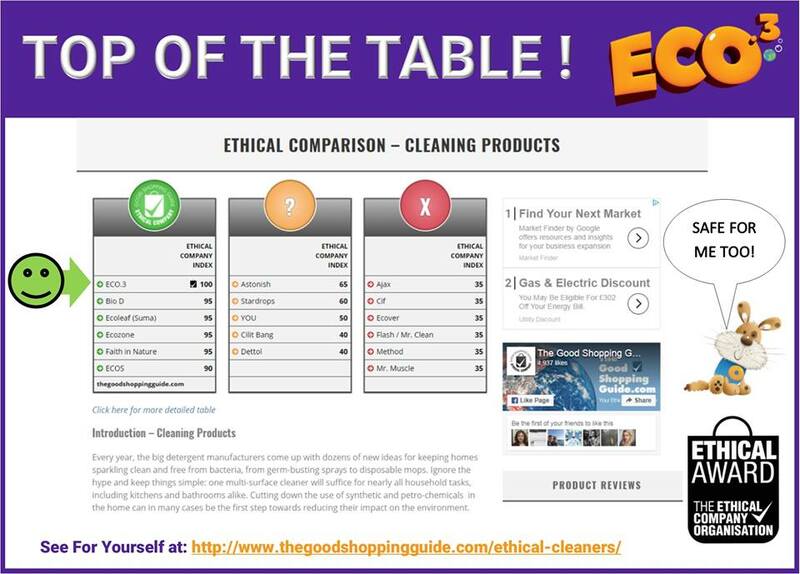 New research on ethical performance conducted by The Good Shopping Guide shows that ECO.3 products top the table. You can check out how all your favourite brands compare. Every year, the big detergent manufacturers come up with dozens of new ideas for keeping homes sparkling clean and free from bacteria, from germ-busting sprays to disposable mops. Ignore the hype and keep things simple: one multi-surface cleaner will suffice for nearly all household tasks, including kitchens and bathrooms alike. Cutting down the use of synthetic and petro-chemicals in the home can in many cases be the first step towards reducing their impact on the environment. Household cleaning products are formulated from a wide range of ingredients, and almost always contain surfactants (detergents) which help to remove dirt and grease and allow them to disperse in water. Natural surfactants can be derived from vegetable substances, but many big brands continue to use petroleum derivatives such as the much-criticised sodium lauryl sulphate. Petroleum-based surfactants are derived from a non-renewable resource and often biodegrade more slowly and less completely than those produced from vegetables. During the degradation process, they can form compounds that are even more dangerous than the original chemicals themselves. European countries, including the UK, have been discussing a strategy that would enforce people’s right to know about all the chemicals present in cleaning products. At the moment, manufacturers of household detergents can continue to use toxic or potentially toxic chemicals in their products. For the Washing-Up Liquid sector, we have introduced a new ethical criterion: ‘Toxic Chemicals Policy’ which assesses a company’s policy – or usage – of certain chemicals in their products. There is a lot of ‘chemophobia’ about synthetic chemicals, as well as a lot of misinformation about which are harmful and which are not. To be fair, a lot of the science is still catching up in this area. Some synthetic chemicals are listed as ‘controversial’, with evidence still lacking. Other synthetics that were once listed as ‘controversial’ and which were once promoted as a ‘hazardous’ have been found to not be harmful on the scale of human consumption. Finally, it is also true that some synthetics have been found to be harmful, to humans or the environment or both. It is important to keep up with the latest science. Based on the opinion of various experts in this area (scientists, environmentalists, public health organisations, etc), we have specifically focused on the following chemicals which are considered to be most harmful to the environment and human health but are legally allowed for use in products: formaldehyde, parabens, phthalates and triclosan. Formaldehyde can be found in cleaning (and beauty) products and is used as a preservative to help prevent bacteria growth. Formaldehyde is a respiratory irritant that can cause chest pain, shortness of breath, coughing and nose and throat irritation. It has been linked to an increased risk of asthma and allergies in children and is also recognised as a human carcinogen. Parabens are widely used in cleaning (and beauty) products as preservatives – preventing the growth of bacteria, mold and yeast. Some studies point towards parabens containing estrogen-mimicking properties, which are associated with an increased risk of breast cancer. Are used in numerous cleaning (and beauty) products, with the main benefit of increasing flexibility and softness and they are also used in synthetic fragrances. Phalates are known to be an endocrine disruptor and have also been linked to an increased risk of breast cancer and reproductive birth defects. Triclosan, which can be found in cleaning (beauty and health) products, is used as an anti-bacterial/fungal chemical. Triclosan is known to be an endocrine disruptor – especially thyroid and reproductive hormones and as a skin irritant. 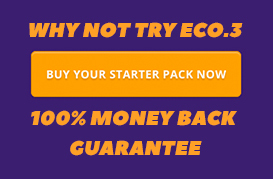 The Toxic Chemicals Policy ratings are based on the policies of the Company Group – not the brand itself (this is because an ‘eco’ brand which excludes these chemicals, could be owned by a company still using these chemicals in other brands). To find out about the methodology behind the ratings, see the Toxic Chemicals Policy information here. A general claim of ‘biodegradable’ on the labels of many products is misleading, because all such products are biodegradable; the question is how readily the elements biodegrade. There is a big difference between products breaking down entirely in hours or days, rather than partially over months or years. Read the label carefully: terms such as ‘surface active agents’, ‘cleaning agents’, ‘soil suspending agents’, ‘grease cutters’ and ‘grease removers’ are often just clever names for petroleum-based surfactants. A regrettable side-effect of companies’ quest to find different products to do what is essentially the same job (cleaning a surface) has been an increase in animal testing. However, you can search the cruelty free website for a list of companies which carry their Leaping Bunny logo – a guarantee that a product is totally free of animal testing. More and more cleaners are now being marketed as being ‘especially formulated’ for the bathroom or kitchen sink, when in reality there is very little difference between the cleaning requirements of the two areas. Greater quantities of bleach and detergent are discharged directly into sewers from domestic premises than from the factories making them. Several types of bleach exist, all of which act by oxidising, and thus sterilising, organic matter. This powerful antibacterial effect has been seen to persist beyond the u-bend, undermining the bacterial action that helps break down sewage. For this reason bleach should be used in diluted form, if at all, and should never be poured neat down drains. Neither Ecover nor Bio-D produce household bleach, because they believe the action is unnecessarily powerful. Their toilet cleaners rely on acids which dislodge waste rather than sterilise it. Another reason for not using bleach is the danger it poses to humans. When chlorine-based bleaches are mixed with ammonia they release dangerous chlorine gas. An estimated 6,000 infant and toddler accidents are attributed to household cleaners each year. The most common ingredient (up to 90 per cent) of general-purpose cleaners is water. When this excess water is transported, energy and packaging is wasted and more solid waste is created for our landfills. Concentrated products in smaller bottles are a better option. Cleaning product bottles are usually made from plastic. Greenpeace urges individuals to make a conscious effort not to buy things in polyvinylchloride (PVC) containers. There is usually a symbol on the bottom of the bottle indicating the type of plastic: PVC is indicated by a ‘3’ in a recycling symbol. High and low density polyethylene (HDPE and LDPE), polypropylene (PP), polyethylene (PE) and polyethylene tetraphthalate (PET) all have fewer environmental problems associated with their manufacture and disposal than PVC. Why not avoid synthetic chemicals altogether with some old-fashioned remedies? Try white vinegar, baking soda, salt, lemon juice and olive oil as handy DIY ethical cleaners.